Modern architecture may have different interpretations but there’s one thing that all architects and designers agree upon – the need to go green in design. There are many different ways to go green in modern architecture today, and there are plenty of benefits to go along with them. Green buildings are equipped with a whole range of features and facilities that showcase and highlight the advantages of environment-friendly design. These features could range from energy-efficient lighting, heating and cooling to water-saving devices, alternate power sources and a lot of natural plants surrounding the building. Installing vertical garden planters around the perimeter of the building is the latest trend. For a building to be truly green, it has to be sustainable – a major challenge for architects today when designing modern buildings. Sustainability has several different forms, but by definition it just means the building is built to last through many different environmental and architectural changes. Some sustainability features may include using a swimming pool as a holding tank for an irrigation system or even a living wall garden or two to create oxygen and absorb carbon dioxide. These living wall gardens can also act as insulators and natural noise absorbers for buildings around busy streets or neighbourhoods. 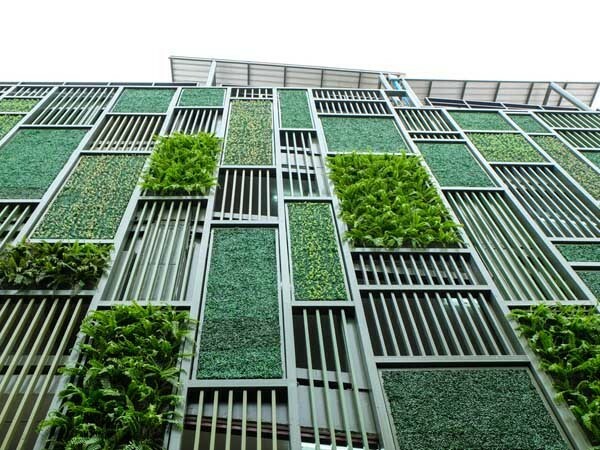 Going green is the best way to create modern and sustainable buildings today and there are several ways to achieve the desired eco-sensitive outcomes. Indoor living walls, for instance, can improve indoor air quality and enhance productivity in a work environment. Rainwater collection tanks will not only eliminate needless wastage of rainwater but will also serve as a source of water for gardens and toilets. There are so many different possibilities for creating green buildings in an affordable way with minimal dependence on resources and labour. Evergreen Walls is focussed on providing products that are not only green, but also modern and sustainable to fit in with newly designed buildings today.